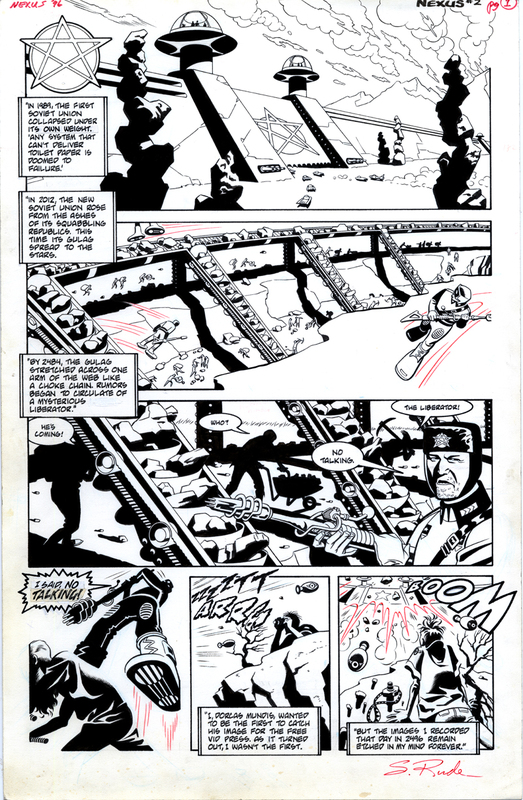 This is my latest acquisition, my first original page by Steve Rude (inked by Gary Martin). I bid $100 on it in the Heritage Weekly Comics Auction without examining it too closely, and walked away, being surprised on Sunday evening when I was alerted that I won. It’s a pretty cool page for what it is (exposition, mood building, setting up the beginning of the story). I like the echoing design elements in the first 3 horizontal panels (the diagonal architectural members on the gulag wall in panel 1, the ore conveyor belts in panel 2, continuing the diagonal motifs of panel 1, and the close-up on the diagonal ore lifters in panel 3). The first 3 panel have a very cinematic “long take” feel; with each panel we get closer and tension builds, until we get to the staccato rhythm of panels 4 through 6, which culminate in an off-panel explosion which, presumably, we’ll get a better look at on page 2. I especially like panel 3, where we have three slaves separated by the two conveyor belts, each with a terse word balloon, ending on the equally terse word balloon of the guard. Mike Baron (the writer) and Rude use the reader’s left-to-right eye read like a camera panning across the full figure silhouettes of the slaves, ending with a medium close-up on the guard. My only niggling caveat is that the guard’s word balloon falls between those of slaves two and three; I would have preferred it lower in frame, perhaps (to continue the left-to-right eye-read pan) over the guard’s chest. The page is almost casually brilliant, an off-hand, function demonstration of facile storytelling ease by two creators at the top of their game.